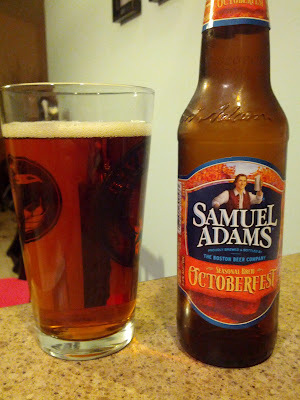 2 “Cincinnati” Octoberfest beer reviews + What is an Oktoberfest (aka Marzen) beer? August is gone, September has begun and somehow it’s time for Oktoberfest already. Tonight I’m going to review two Marzen beers, Cincinnati’s own Christian Moerlein Fifth & Vine (brewed in PA) and Sam Adam’s Oktoberfest (brewed in Cincinnati). First off Marzen and Oktoberfest styles are the same thing, I plan to stick to using Marzen in general just to differentiate the style from the Oktoberfest events held around the world. First off a big question, what exactly is a Marzen beer? What goes into this style that makes it so special? If you know German you know that Marz means March so Marzen basically means March beer. Which get’s confusing, because now we’re drinking a “March beer” in September at Oktoberfest? Well, it’s a “March beer” because that’s when they brewed it. Before artificial refrigeration, they couldn’t brew beer in summer so March was the end of the brewing season. After brewing these beers, they would store them in caves or basements, aka lagering tunnels[footnote]For more info on lagering tunnels be sure to take one of these tours from The Original Cincinnati Brewery Tours during Oktoberfest weekend here in Cincinnati. Not only do you get loads of great information about Cincinnati beer history but you actually get to go down into 150-year-old lagering tunnels! [/footnote], so they wouldn’t spoil in the hot summer. They’d often make it stronger than their other beers to help it keep longer. 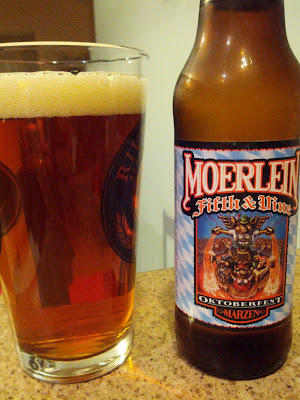 This style, like everything Oktoberfest and everything lager, is important to Cincinnati due to the city’s German heritage as such I’m starting my reviews off with Moerlein’s Fifth & Vine! Shouldn’t it be fifth? Or Tyler Davidson Fountain? Fifth & Vine is a very 2005+ mindset. This is a great looking beer which does an awesome job of looking like that kind of generic idealized version of what “beer should be”. Which is to say it’s got a great, completely transparent, light reddish/brown color with a layer of cream-colored head. Aroma is full of nice malt flavors, very clean aroma. Very different from what I’m used to with all the IPAs I’ve had lately. It’s strange to have no fruit aromas at all. The taste is very sweet, as beer goes, not too sweet of a flavor but decent. Again this is a nice change from the fruity bitter hops of IPAs. This feels like a medium body. It certainly has some mild carbonation to it. From a Cincinnati beer brewed in Pennsylvania to a Boston beer brewed in Cincinnati! See… very descriptive sensible name. I’m not gonna spend time talking about the color here because it’s identical. Though there was much less head and dropped away almost immediately. Smell is a different, though, the biggest change is the slight herbal hop presence. The malt flavor is also more complex with sweetness as well as some toastiness. Flavor follows a similar path with more hopiness and toasted qualities. Identical mouth feels with slightly more crispiness on the bite. I like this quite a bit better than the Fifth & vine. This may not be as true to the Marzen style as the Fifth & vine was, but is a more interesting and more pleasing beer.